One non-Disney movie that has both fascinated me and frustrated me for decades was the Universal Pictures motion picture 40 Pounds of Trouble (1962). It was rarely available for viewing after its initial theatrical showing (except for a few occasional edited airings on television). It did have a brief release on VHS in 1996, but quickly disappeared. Very little information exists on this unusual film and there have been many questions about its Disney connection over the years. Of its roughly 106-minute running time, nearly 20 of those minutes are full color footage of Disneyland, from a ride on the Matterhorn Bobsleds to a visit to Tom Sawyer’s Island to some rather odd Disneyland experiences that never happened for any regular guest. The short story Little Miss Marker by newspaper writer Damon Runyon (two of his other short stories were combined into the musical Guys and Dolls and another inspired the film Pocketful of Miracles) tells the tale of 5-year old Martha "Marky" Jane whose father leaves her in a gangster-run gambling establishment as a "marker" (collateral) for a bet. When the father dies before he can return to claim her, the gangster Sorrowful Jones is left with the kid and, with the help of a sentimental floozy, takes care of the girl. The story was made into a Paramount Pictures movie with Shirley Temple (and made her a box office star) and Adolph Menjou in 1934. It was remade in 1949 by Paramount as Sorrowful Jones with Bob Hope and in 1980 by Universal as Little Miss Marker with Walter Matthau and Julie Andrews. What makes this information of interest to Disney fans is that it was also made by Universal as 40 Pounds of Trouble starring Tony Curtis. That version features very rare full color footage of Disneyland in 1962, showcasing some things that would disappear completely over the following years, as well as many surprises. It was the first and only non-Disney produced theatrical film that was ever filmed at Disneyland while Walt Disney was still alive. Originally filmed in Eastman Color and Panavision, the current DVD release has a very good 16x9 widescreen anamorphic transfer so it looks much more appealing than it has in years of poor dubs from previously existing VHS copies. Steve McCluskey (Tony Curtis) is the manager of the Villa D’Oro, a plush $25 million gambling establishment just over the California line at Lake Tahoe, Nevada owned by Bernie “The Butcher” Friedman (Phil Silvers). The Lake Tahoe sequences were shot at Harrah’s Lake Club at the south end of the lake that had opened in June 1955. This was one of the first films to show the actual interior of an operating casino. It was later sold to Harvey Gross in 1956 and was renamed Harvey’s Lake Tahoe. Steve has such a hatred for his ex-wife that he refuses to pay her any alimony, but cannot be served by an attorney for non-payment unless he crosses the state line into California, which he does occasionally to visit Los Angeles because he enjoys the challenge of the chase. While Steve is successful, well-liked and happy, things change rapidly with the arrival of a new husky-voiced lounge singer, Chris Lockwood (Suzanne Pleshette). Everyone, including Steve, thinks the young woman is the mistress-girlfriend of Bernie, but she is actually his niece. At the same time, a 6-year-old girl, weighing 40 pounds, named Penny Piper (Claire Wilcox in her first movie) pops up. Her father left her in his hotel room to make a fast trip to San Francisco to grab some cash to pay off his gambling losses. When her father doesn’t return, Steve decides to avoid adverse publicity for the casino and moves her into a room in his suite where he begins to bond with her like a surrogate father. Penny’s big obsession is to go to Disneyland and Steve keeps deflecting her requests. Seeing his sincere attention to the youngster’s welfare, Chris warms up to Steve and Penny encourages that connection. Unfortunately, it is learned that Penny’s father has not returned because he was killed when his car accidentally plunged over a cliff. Unable to tell Penny the truth especially since she is also motherless, Steve decides to take her to Disneyland first to help ease the news and he quits his managerial role. Chris convinces him to take her along as well so that they will look like a typical family, and she can do things like take the girl to the public bathroom that Steve can not. If Steve gets caught in California, he will be served papers by his ex-wife and arrested. Of course, Steve’s ex does find out and the result is a wild chase through Disneyland by an unnamed cigar chomping police detective played by 6 foot 3 inches tall actor Tom Reese who always seems one jump ahead of Steve. The detective is dressed in a suit and tie and wears a hat and doesn’t seem the least bit out of the place in the vacation venue. Steve is finally caught in the Disneyland parking lot. Both Steve and Bernie are brought by the district attorney to a court hearing. The hearing takes some strange twists and Steve’s request to adopt Penny is denied because of his single status. For the happy ending, Steve marries Chris and they adopt Penny. Bernie has his gambling license renewed and is so pleased that he offers Steve his manager job back after Chris, Steve and Penny return from their honeymoon…at Disneyland. The film is a lightweight piece of fluff common in Universal’s romantic comedies of the time period like Pillow Talk (1959), Lover Come Back (1961), and Send Me No Flowers (1963) that featured actress Doris Day. The screenplay was written by Marion Hargrove, who gained fame for his lighthearted columns about becoming a soldier during World War II that were later the basis for both a novel and a film. After the war, he wrote two more novels and numerous articles for magazines. In 1955, he moved to Los Angeles and began writing for television, including episodes of Maverick (1957), the pilot script for 77 Sunset Strip (1958), I Spy (1966), and The Waltons (1975), among others. He also wrote the screenplay for the musical film The Music Man (1962) for which he won the Writer’s Guild of America Award. That film was released the same year as 40 Pounds of Trouble. Norman Jewison would become one of the most successful filmmakers with credits including films like The Russians Are Coming, The Russians Are Coming (1966), In the Heat of the Night (1967), The Thomas Crown Affair (1968), Fiddler on the Roof (1971), and Jesus Christ Superstar (1973), among many others. However, everyone has to start somewhere and 40 Pounds of Trouble was Jewison’s first film. He had been directing the Judy Garland television special when Curtis visited during a rehearsal, and was impressed with how Jewison was handling himself. Curtis suggested that Jewison should direct a feature film. Curtis had his own production company (Curtis Enterprises) and a relationship with Universal where he had been on contract, so Jewison was given his chance to direct the romantic comedy. 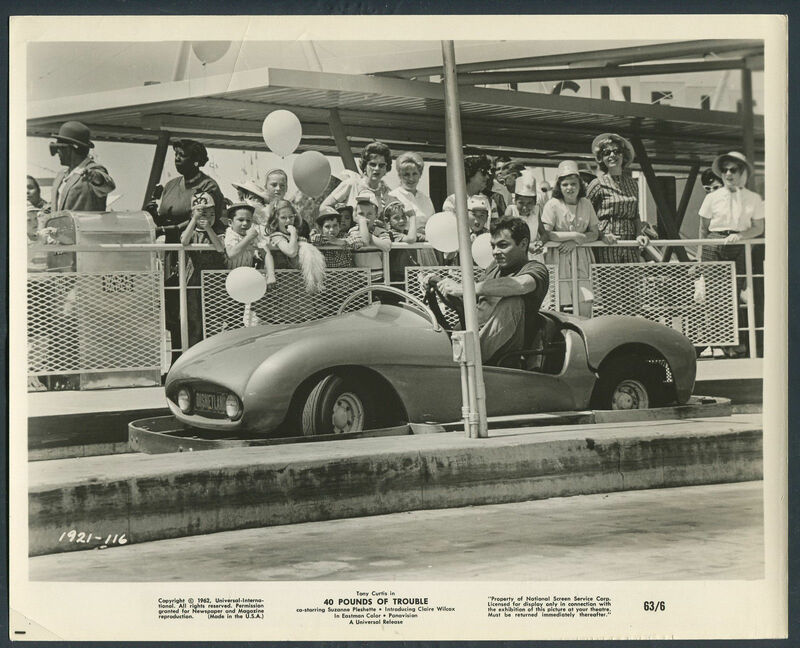 Curtis had been one of the many celebrity guests that attended the July 17, 1955 press preview opening of Disneyland and was equally adept in both dramatic and comedic roles. 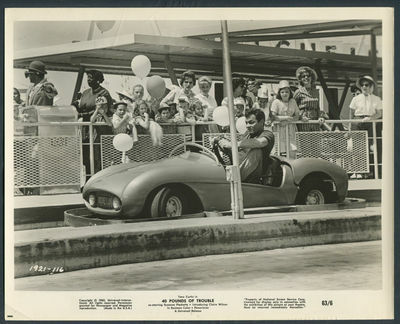 The filming of the Disneyland scenes took place in May 1962 and, in June, Curtis was granted a divorce from his first wife Janet Leigh. While actress Suzanne Pleshette is best remembered as Emily Hartley, the sharp-tongued wife on The Bob Newhart Show (1972-1978), she had a rich performing career. The Theater Owners of America organization declared Pleshette as “1963’s Most Exciting New Star” even though she had been doing stage and television work since the 1950s and her first film was Jerry Lewis’ The Geisha Boy (1958). Lewis and Curtis were good friends. In February 1961, a year before 40 Pounds of Trouble, Pleshette took over the role of Anne Sullivan performed by Anne Bancroft, opposite Patty Duke, who was still playing Helen Keller in the Broadway production of The Miracle Worker. In 1963, after 40 Pounds of Trouble, she had a pivotal role in Alfred Hitchcock’s The Birds as a school teacher killed by crows. Walt later saw her performing on a television show and, after inquiring about her credits, held a special screening of 40 Pounds of Trouble and cast her in The Ugly Dachshund (1966) opposite Dean Jones. So, in an odd twist of fate, her appearance in this Universal film helped spawn her Disney film career. She also appeared in Disney’s The Adventures of Bullwhip Griffin (1967) as a singer in a saloon, and again as Dean Jones’ love interest in both Blackbeard’s Ghost (1968), as well as The Shaggy D.A. (1975). In addition, in Lion King II: Simba’s Pride (1998), she provided the voice (both speaking and singing) of the main antagonist, the lioness Zira, who was the leader of the Outsiders in the Outlands and Scar's most loyal follower. She was also the mother of Nuka, Vitani and Kovu, one or more of whom may be the offspring of Scar, and she had raised her son Kovu to be Scar’s successor. She and Walt apparently had a harmless playful flirtatious relationship during her time working at Disney. “Wait’ll You See Their Hilarious Adventures in… Disneyland!” proclaimed the poster for the film and indeed the adventures are hilarious, but not in the way you might first suspect. Those 20 minutes are almost unexplainable and have puzzled many Disneyland fans. For those familiar with Disneyland’s geography, the scenes at Disneyland are like being dropped into the middle of Wonderland, since there is absolutely no regard to the actual layout of Disneyland or how Disneyland operated. For instance, there is a prominent silver pay phone booth on the front of the walkway just off of the Hub leading to Tomorrowland and, when Tony Curtis makes a call, audiences can clearly hear the whistle from the Mark Twain steamboat and the clanging fire bell at the Main Street Fire Station. Neither of those sounds can be heard at that location. By the way, there never was a phone booth in that location and, later in the film, it disappears completely from that place. It was only there long enough to take care of a need in the story. If that wasn’t enough, check out the cast member there selling souvenir hats…on a folding card table. That never existed at Disneyland either. But let’s start at the beginning of the trio’s trip. They arrive by helicopter (a service that was offered in 1962 from the Los Angeles airport) and as they gaze out the window they see the Matterhorn and Monorail Blue as the scene transitions to them in the front cabin of the monorail arriving at the station. As they disembark, they run to the railing and look over and to their immediate delight see Town Square and Main Street U.S.A. They then board the surrey in Town Square (with a prominent sign on the ride showing it costs a dime) and, as they trot down Main Street, they see a costumed Mickey Mouse and Minnie Mouse on the sidewalk waving to them and then a quartet of Keystone Cops (sometimes spelled Keystone Kops) all playing saxophones. The Three Little Pigs costumed characters come skipping out of Tomorrowland’s entrance. Next, the trio are on the Storybook Land Canal Boats, with a hostess in a rose and white dress that was the common costume. There are glimpses of Gepetto’s village, Toad Hall, Cinderella’s village and chateau, as well, of course, high on the hill, the famous “dream castle,” as the hostess describes it. The group rides the Mad Tea Party, the Astro Jets and the Mine Train Through Nature’s Wonderland (with the little girl now wearing mouse ears that she must have lost on the ride since they disappear for the rest of the film). This is followed by a trip on the old Skyway through the Matterhorn. A trip on Peter Pan’s Flight is an interesting experience since, other than the flying pirate ship, there is nothing seen from that attraction. However, there are horrifying scenes from Mr. Toad’s Wild Ride (including the faux train crash at the end) and from the Snow White attraction (including the wicked old hag witch and her poisoned apple). This is followed by a ride on the Matterhorn, sped up a bit to make it look faster and rougher, and before the mountain was enclosed. All three are crammed into the front section with the section behind them completely empty. When they get to the disembark area, they have to escape the pursuing detective, so they all just jump back in to “do it again” which must have delighted the ride operators. 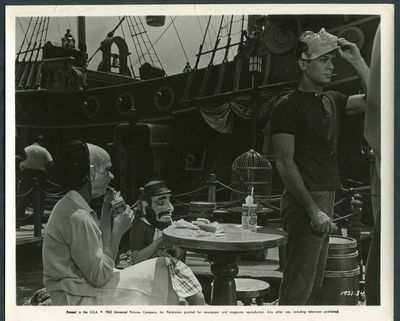 They then share a meal of hot dogs and soft drinks at the outdoor eating patio at the back of the Chicken of the Sea Pirate Ship and Restaurant. To hide from the detective, they wear Halloween masks…of President Kennedy, Soviet leader Nikita Khrushchev and Cuban leader Fidel Castro…that they somehow purchased just minutes ago at Disneyland. The Cuban missile crisis was a 13-day event in October 1962 (this film was released in December) that was a showdown between these three world leaders about Soviet ballistic missiles in Cuba. Fortunately, this dangerous situation was resolved and so this was meant as a humorous commentary, especially with a 6-year-old girl wearing a Castro mask in between bites of her hot dog. While Tony wants to leave, Penny convinces him to make one last stop…Tom Sawyer’s Island. Who should be hiding at the very top of the treehouse on the island? The cigar-smoking detective who chases the trio through the island over the barrel bridge (running into a large, old, uncoordinated grumpy lady, of course) and the suspension bridge (running into a scout troop trying to get across) and finally arriving at Fort Wilderness. At Fort Wilderness is something that Disney fans never saw. In the middle of the day is a flag raising ceremony (which temporarily halts the chase) followed by an Indian attack of Indians climbing over the top of the walls and the sounds of rifle shots continuing during the fight and guests joining in to fight the savages. At the entrance to Frontierland, Steve has somehow been able to obtain a full character costume from the Frontier Trading Post at the entrance…a yellow mushroom from the film Fantasia that was used at the time during the Christmas parade. “Stop that mushroom!” yells the detective while Chris and Penny tell Steve they will meet back up with him at the Main Street train station. As soon as he exits Frontierland he removes the costume, hops over a white fence, goes through a tunnel and finds himself in the Living Desert (with cactus and rolling rocks and an electro-mechanical animal) and the Devil’s Paint Pots (multicolored geysers and he bends over to get a drink from one that shoots off) in the Mine Train ride. He is followed by the detective who seems flummoxed by the exploding geysers. Steve escapes by going to the Indian Village that is on the Rivers of America. When Steve asks the mechanical Indian chief for directions, the character raises its arm. Steve grabs a canoe and paddles away. The detective jumps into another canoe but his legs break through it, sinking the vehicle. The canoe has taken Steve to yet another area with a tunnel and he runs in and quickly runs back out chased by one of the Santa Fe and Disneyland railroad engines. Following those tracks lead him to Fantasyland where he pushes the Three Little Pigs out of his way, rushes by the carousel and out of the castle where he is stopped by a half dozen Japanese sailors who want him to take their picture which he does since there are absolutely no Disneyland cast members around. However, the detective is hot in pursuit and they both end up in the flat grassy Hub where they disrupt the saxophone playing Keystone Cops which sparks a wild chase with more Keystone Cops joining in as they all race round and round the Hub in an attempt to call to mind the famous silent movie comedies. Steve runs away and hops over yet another fence to jump into a gold colored Autopia car. The detective also hops over the fence and into a car driven by a young boy and orders him to give chase. There is a brief cutaway to the Keystone Cops in a turn-of-the-century vehicle careening down Main Street with the Cops falling off, another reference to an iconic image of the silent movie comedians. Steve jumps out of his Autopia car, runs up the hill and jumps on the train to take him back to Main Street where the detective is already patiently waiting. Steve grabs the little girl and runs down to Main Street where he encounters the White Rabbit, Goofy and the Big Bad Wolf, before buying a dozen colorful helium balloons (not the famous Mickey Mouse-headed balloons) and runs out into the parking lot where he is caught. For those who miss the old Disneyland parking lot that became Disney’s California Adventure, there is a long scene to enjoy. Does that sound a little crazy? Well, that’s only the beginning of this story. Next Time: Finally the answer why Walt allowed this Universal film to be shot at Disneyland, and why he adamantly refused all other requests as did the Disney Company for more than three decades after the release of 40 Pounds of Trouble; behind-the-scenes stories of the making of the film, including the utility man who ended up signing 50 autographs; and much, much more. Great story of this film! I have a DVD copy that I purchased only because of the color footage of Disneyland. Can't wait for the rest of this story! Thanks, Jim! Here's a link to some of the footage. It's just called Part 1 and of course, there's a Part 2. Looks pretty cool. Thank you for this article! I can't wait to share it with my family. This movie is very special to us because my Dad was 18 and working at Harrah's when the movie was filmed. One of his many jobs was delivering room service to the VIP's. He must have done a great job because Mr. Curtis asked him to be an extra. He loves that his "18 year old Skinny Self" is immortalized on film as proof he was one time thin. LOL!!! My VHS copy is worn out and I'm excited to head over to Amazon and get a DVD. Sounds like a lot of action for only 20 minutes. I too have this DVD from years ago as soon as I found out it was available from Amazon. Also, from what I understand the scene in the parking lot was actually filmed at the LA County Fairgrounds in Pomona. The geography along US-50 is also "Direct from Wonderland." I lived in Carson City for five years and the tunnel in the movie's opening chase sequence is in Nevada, not California. Interesting typography, very scenic, considerably more built-up in 2010 than in 1962. Harrad's was the casino and the "straddles the border" was exaggerated in the movie. That state-line intersection is just as interesting today as it was in the movie. There are zero Disney credits or credits for the helicopter service by Los Angeles Airways (using Sikorsky S-61L helicopters--here's a link to one of the two fatal accidents https://en.wikipedia.org/wiki/Los_An...ays_Flight_841 ) but "Forty Pounds of Trouble" was free advertising. I hope in Part Two you can shed some light on how Universal and Disneyland hammered out the copyrights and intellectual property things. For example, were the scenes in the park filmed using Disney employees and family during one of the days that Disneyland was closed to the public?